A snapshot will take you directly to a particular screen in the App (e.g. the New snapshot will take you the New Activity Screen in the example above). The bottom right snapshot can also display information directly on the app (e.g. 10 Due Activities). Let’s take a closer look at how to configure a Snapshot. You will find them if you manage any app. 2. If not selected, choose Number. Count - count all the records. Sum - go through all the records looking at a given field containing a number, and add those numbers together. Avg - go through all the records looking at a given field containing a number, and get the average. Max - go through all the records looking at a given field containing a number, and get the maximum number. Min - go through all the records looking at a given field containing a number, and get the minimum number. 4. Select the Table which has the records you wish to display. 5. Select the Field which contains the values you wish look at. 6. Continue below with Selecting a Screen to Go To. 2. If not selected, choose Icon. 3. Choose an icon from the dropdown. Example: You want a shortcut on your Activities App to take the user to the New Activity screen. Assign a "⊕" icon to indicate adding a new activity. 4. Continue below with Selecting a Screen to Go To. 1. 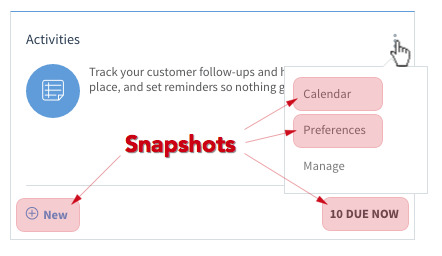 Label - Choose text that indicates what the snapshot is for.Example: "Active Contacts"
2. The Go to screen dropdown allows you to choose what screen users will be sent to when they click this Snapshot. The dropdown will display all screens in the app you are currently managing, so choose the one that works best (for example, if you are in the Contacts app, you can choose to go to the “Contacts List” screen). Menu - Snapshot will appear in the contextual menu when user selects the vertical ellipsis ( ⋮ ). In this case, only the lable shows and icon or number is hidden. Right - Snapshot will appear on the bottom right of the app. Left - Snapshot will appear on the bottom left of the app. Adding a filter only appears if you select a Number Snapshot Type. Normally, the snapshot will include every record in the table to apply the Number Type Function to. For example, without a filter, you can show a count of all the records in the Contacts table. However, you can choose to only look at a subset of the records in the table. Again, let's use the Contacts table as an example. You could have the count show only Active contacts. When you add a filter, you will see a small grid which acts in the same way as the Criteria Builder. 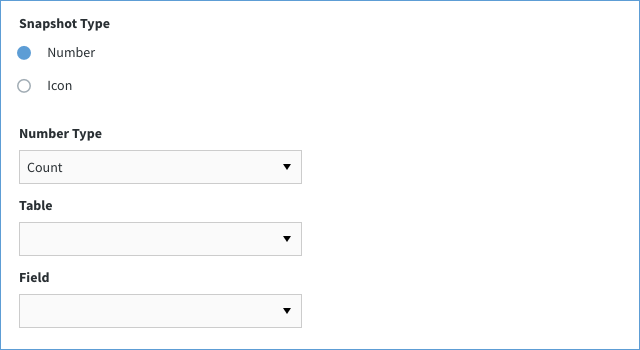 To recreate our example of only active contacts, you will need to add a condition, setting the first dropdown to the IsActive field, and the second dropdown to Is True.